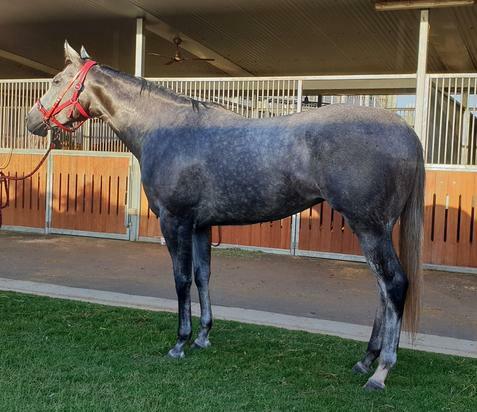 DASH FOR CASH (AUS) (Grey 1998-Stud 2003). 5 wins-1 at 2, VRC Australian Guineas, Gr.1. Sire of 597 rnrs, 387 wnrs, inc. SW Arinosa (ATC Sapphire S., Gr.2), Chase the Rainbow, Bank Robber, Shuffle the Cash, Dodging Bullets, Dashitude, Boom 'n' Zoom, Dandy Dollar, Extension of Time, SP With a Bit of Dash, Cash Bound, Grand Britannia, Two Sugars, Andaz, Sea of Tranquility - Ready to Dance (Mal. ), Onerous, Silver Dollar, Dash for Home, etc. All Troops (g. by All Bar One). 4 wins-1 at 2-at 1000m, 1100m, A$99,450, SCTC Yalumba H., BRC Gallopers Sports Club H., 2d BRC Relaxed Racing H., Ipswich TC Schweppes H., 3d Ipswich TC Sirromet Wines Bundamba 2YO P., BRC Optus Business Centre H., Alan Russell H., Ipswich TC QT H., Ray White H.
Duchess Dashalot (f. by Dash for Cash). Winner. See below. Chairman Lo (g. by Sidereus). Placed at 3 in 2018-19, 2d HKJC Lung Hang H., Po Leung Kuk 140th Anniversary H., Geranium H., BMW Centenary H., 3d HKJC On Ting H.
Peace Talks. 14 wins-1 at 2-from 1200m to 1650m, A$150,810, 2d SCTC BOQ Chancellor Park & Mooloolaba H., 3d Qld Tatt's RC Travel Associates H., Carlton Mid Country Cup, Roma Cup. Foretoken. 7 wins to 1100m, A$99,875, Ipswich TC Celebrate Miner's Centenary H., PA Hotel H., 2d BRC XXXX Gold H., Ipswich TC City of Ipswich H., SCTC Coastline BMW H., 3d BRC Girls Day Out H., Ipswich TC Ray White H.
Heart Hunter. 2 wins at 900m, 1000m in Aust. Donquinn Dotty. Winner at 1050m in Aust. Love That Lion. Winner at 950m in Aust. Princess of York. Winner at 1400m in 2018-19, 2d TTC Drummond Gold H., 3d TTC F&W Stewart Silver Ingot 2YO P.
HADAAF (Danewin). 15 wins-3 at 2-from 900m to 1800m, A$750,233, STC Civic S., L, AJC Hayai Welter H., Tullamax Welter H., STC Theraces.com.au Welter H., Parramatta Leagues 2YO H., MVRC CFMEU FFTS. H., Illawarra TC Freeway H., AJC CVD Bottle Gift Shop H., TAB Power Pays H., Ash 2YO H., STC Theraces.com.au H., Hyland Race Colours H., Book Now for Golden Slipper Festival H., 2d STC Sky High S., L, 3d BRC Lord Mayor's Cup, Gr.3, STC Premier's Cup, L, 4th STC Apollo S., Gr.2. Danish Magic (Danewin). 2 wins at 2, A$673,890, AJC Heroic 2YO Championship S., STC Wests Ashfield 2YO H., 2d AJC All Saints Boys Golden Jubilee P., City Tatt's RC Chairman's 2YO P., 3d AJC Keith Mackay H., L, Widden S., L, Sydney City Lexus H., STC Michael Hansell Signs H. Producer. Savedbythebell (Secret Savings). Winner at 2, 2d BTC Golden S., L, Universal McCann H., QTC Programmed Maintenance Services H.
North Beach (Footstepsinthesand). 9 wins to 1050m, A$208,810, SAJC Evright.com H., Clean SA H., Adelaide Galvanising H., Oakbank RC Coca-Cola H., 2d SAJC Wolf Blass & Associates H., Nikki Dyer's 40th H., Pewsey Vale H., 3d Oakbank S., L, SAJC Allan Scott Park Morphettville H., Patinack Farm H., Betfair H., Centrebet's Best of Best H.
Ashero. 3 wins-1 at 2-at 1000m, 1050m to 2017-18, SAJC Hughes Chauffeured Limousines 2YO P., 2d SAJC MAC Stop Drug Driving H., 13cabs H.
LADY PURPOSE (Sir Tristram). 2 wins-1 at 2-at 1200m, 2000m, A$124,100, VRC Waltzing Lily H., L, VATC Norman Robinson S., L, 2d VRC Maribyrnong P., Gr.2, 3d VATC Debutante S., Gr.3. Producer. OASIS BLOOM (Al Maher). 2 wins at 1600m, 1700m, A$326,900, MVRC WH Stocks S., Gr.2, VRC Crown Promenade Trophy, 2d MVRC WH Stocks S., Gr.2, MRC Herbert Power S., Gr.2, Race-Tech Classic, L, 4th VRC Myer Classic, Gr.1. Producer. UNDERESTIMATION (Al Samer). 6 wins-2 at 2-to 1400m, A$356,355, VRC Anzac Day S., L, 2d SAJC Breeders' S., Gr.3. Winner at 900m in 2018-19 in Aust.